No other city can surpass Dubai in extravagance, luxury and exclusivity. Dubai is famous across the globe for its classy, overindulging and high-end bars, pubs, lounges and restaurants. These refined bars of Dubai offer you a divine treat of liquors and smolders to gratify your yens in style. The super classy Cigar Bar Dubai is another hidden secret of the city and a royal treat to its high-end and exclusive visitors. Although there are numerous Cigar bars in Dubai, there are far and few that delights with superiors products and service and premium quality. So here we have rounded up the top five Cigar bars in the town, so just feed their names and locations in your mind or maybe in your phone, so that you never forego especially when the evening calls for a gentleman’s night out with your so desired whiskies and sticks. Think of dark rich mahogany furniture, glamorous décor and melancholic lighting; this is the ambiance that your happenstance will be with once you pass into the swanky Cigar Bar. Most of all, the thing that will impress you the most will be its extensive array of top notch cigars from superlative brand made exclusively for high-end users. Other things that will surprise you is that these posh cigars are kept within a hand hewed walk-in humidor which is truly amazing. This Cigar Bar Dubai, also offers you to choose from a wide collection of whiskeys, cognacs and vodkas to double the pleasure. Cigar Bar is placed at the Fairmont Hotel on Sheikh Zayed road. It is truly a wonderful discovery of cigar fonder. Relish the worldly experience of puffing out perfect smoke rings in relaxing yet classy and extravagant settings. The Cigar Lounge is an embellishment for enjoying classy and refined smoking experience. Pitched over the 13th level of the Address Hotel, it gives you a stunning panorama of Burj Khalifa. The Cigar Lounge has the best collection of alcoholic and non-alcoholic beverages. This place is all set to allure you beyond a typical business-class stuff. It is situated at the Lobby Level of The Address Hotel, Downtown Dubai. Situated on the 44th floor of the Grosvenor House and designed in a rich, sophisticated and swanky style and décor, Bar 44 has been one of premier cigar bars of Dubai for a considerable period of time also one of the most exorbitant spots around the town. Make the most of your exclusive and pricey stogie with a decent glass of wine while eavesdropping to the soft tunes of a live musicians and appreciating the Dubai horizon beneath. This exclusive Cigar Bar Dubai is located at the Grosvenor House Dubai – Al Sufouh Rd. – Dubai. Get your offer of tapas and cigars at La Casa Del Habano situated at the Jumeirah Beach Residence. While you search across the rundown of more than 1,000 various types of stogies and cigars along with the delectable tapas entrees, you may see this bar doesn’t serve liquor. Maybe the main inadequacy of La Casa Del Habano is that you can’t have a pleasant whisky as you puff away, you’ll all things considered be entirely stunned at the determination of heavenly snacks, cigars and high-end service. This premier Cigar Bar is located at the Walk, JBR – Dubai. While numerous cigar bars in Dubai only offer a choice of stogies in one specific corner; Vault keeps what makes a difference up front with a stroll in humidor holding 18 unique and exclusive brands, from limited edition pieces to crowned cigars, for example, Montecristo Grand Edmundo and Punch Robusto UAE, to more standard brands like Churchills. Leaning back on dim cowhide seats on a finished wooden ground surface and a fire lit back divider, Vault gives you the sentiment sitting with present and past. Represent considerable authority in malt whiskies and with a vast accumulation of, one of The Vault’s special evening of malts, cigars, wines and chocolates are not be missed for the refined expert. The Vault is located in JW Marriott Marquis Dubai, Sheikh Zayed Rd – Dubai – United Arab Emirates. 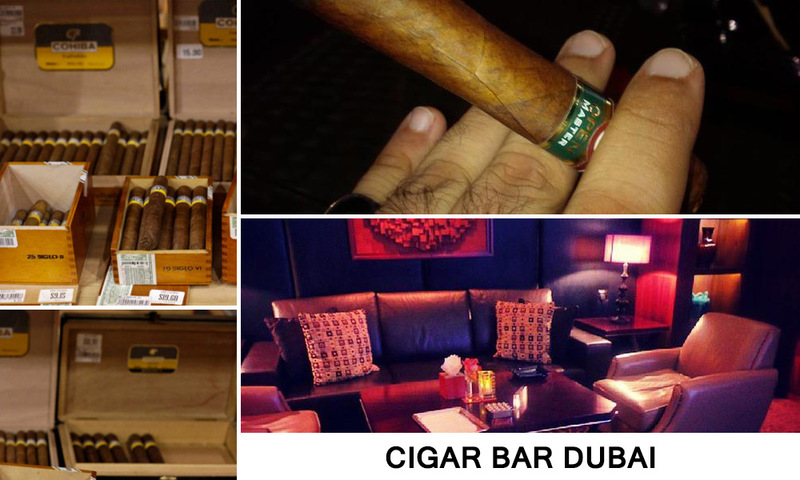 These are some of the famous Cigar Bars in Dubai, which offer quality products to the visitors. If you have visited one of the above mentioned Cigar Bars and would like to share your experience, please do so by adding comments below. To recommend a Cigar Bar Dubai, please add comments below as well.